NOTRE DAME, Ind.— The No. 3 Notre Dame Fighting Irish (10-0) continued their perfect season on Saturday night under the lights of Notre Dame Stadium by defeating Florida State (4-6, 2-5 ACC) 42-13. In their final game in South Bend, the Fighting Irish recognized their seniors before the start of the game. Notre Dame dominated the first half offensively, carrying a 32-6 lead into halftime. Miles Boykin opened the scoring with a three-yard touchdown reception from Brandon Wimbush, just 1:15 into the first quarter. The short drive was set up by an interception from Nick Coleman on Deondre Francois’ first pass attempt of the evening. Boykin’s touchdown reception marked his sixth consecutive game with a touchdown, becoming the first Notre Dame wide receiver to do so since Will Fuller V did so in 2014. Alize Mack hauled in two touchdown receptions for Notre Dame in the half as well. Mack finished the contest with three receptions, two of which were touchdowns. The storyline of the week out of South Bend was that quarterback Ian Book would be unable to play in Saturday night’s contest, leaving Brandon Wimbush to start. Wimbush led the Irish offense for the first three weeks of the season, including the teams 24-17 victory over Michigan. Wimbush stepped up to the plate and showed why he had been Notre Dame’s quarterback throughout the entire 2017 campaign as well as the beginning of the 2018 season. Wimbush tied his career high with three passing touchdowns and added 130 yards through the air. While Kelly would not name Book the starter for the Syracuse game, all signs point to Book moving back to QB1, if healthy. Brutal playing conditions may have played a part in Florida State’s sluggish start to the contest. With a temperature of just 27 degrees at the opening kickoff, it was the third-coldest game in Notre Dame Stadium since 1980. Despite the awful conditions, the contest marked the 268th consecutive sellout of Notre Dame Stadium, dating back to 1974. Florida State responded by opening the second half with a seven-yard touchdown run by Cam Akers. Stanford Samuels intercepted Wimbush on Notre Dame’s first drive of the half, setting the Seminoles up with fantastic field position. Notre Dame’s defense came up with a superb goal-line stand late in the third quarter, eliminating a Florida State scoring threat. The Seminoles began with first-and-goal from the one-yard line before the Irish defense smothered the threat. Florida State came into the contest with one of the top run defenses in the country, allowing just 111.1 yards of rushing per game coming into the contest. Notre Dame torched the Florida State defense en route to 365 yards on the ground. Dexter Williams contributed with 202 yards on 20 carries, including touchdown runs of 58 and 32 yards. 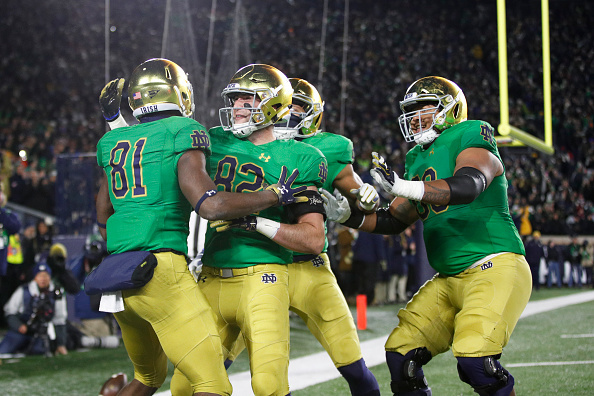 Heading into the final two weeks of the regular season, Notre Dame is clicking on all cylinders and producing in all three aspects of the game – offense, defense, and special teams. If Notre Dame can continue at this pace, they should continue to win out for the remainder of the regular season. Next week, Notre Dame will head to Yankee Stadium in New York City to take on No. 13 Syracuse (8-2, 5-2 ACC) in the “Shamrock Series” game on Nov. 17. Despite the game being played closer to Syracuse’s campus, Notre Dame will be the home team. Florida State returns home to Doak Campbell Stadium to take on No. 17 Boston College.